I was first introduced to plantain chips on my very first trip to my husband’s native country – Colombia. There are slight variations in preparation such as twice fried patacones, which are typically larger and thicker than the ones featured today. We’ll make those another time and show you how. 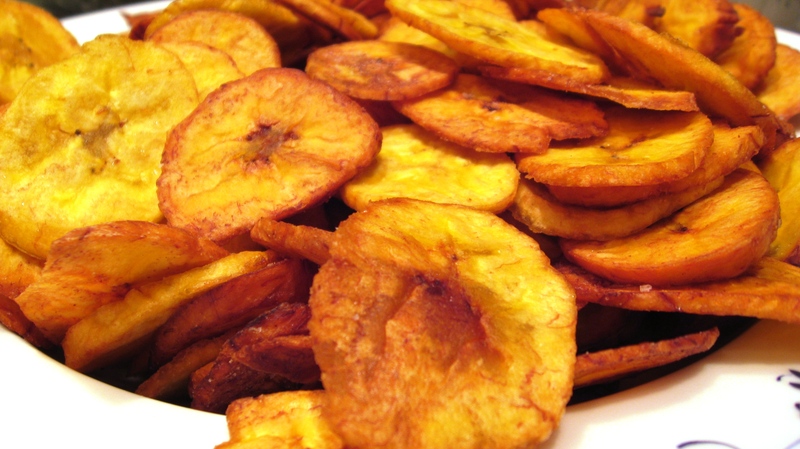 Plantain chips are a typical component of the Colombian cuisine and are usually served with lunch or dinner. Have a try and you too will be smitten with this amazing alternative to traditional potato chips and the other unhealthy usual suspects. Heat oil in a non-stick wok or high-rimmed skillet to about 375 °F. Cut the ends off of the green plantains. Score the skins of the plantains with a sharp knife lengthwise about 3 times. Do not score on the natural ridges of the fruit, but in between them. Also do not score them too deeply. In a bowl of water, soak plantains for about 5 minutes. Peel plantains and slice them thinly either at an angle or in straight slices, your call. I like to use a sharp knife instead of a mandolin. Place thinly sliced plantains (1/8 inch) into hot oil and fry until lightly golden, flip and fry until rich golden in color (about 30 seconds each side). Scoop out and place on paper towels. Sea salt lightly immediately. Sometimes we add a little cayenne to the sea salt and sprinkle the plantains for a bit of a kick. These are absolutely delicious and my husband’s favorite! Cook a meal in 30 minutes or less!